The mountain bike team has been busy on the trails during the month of October. 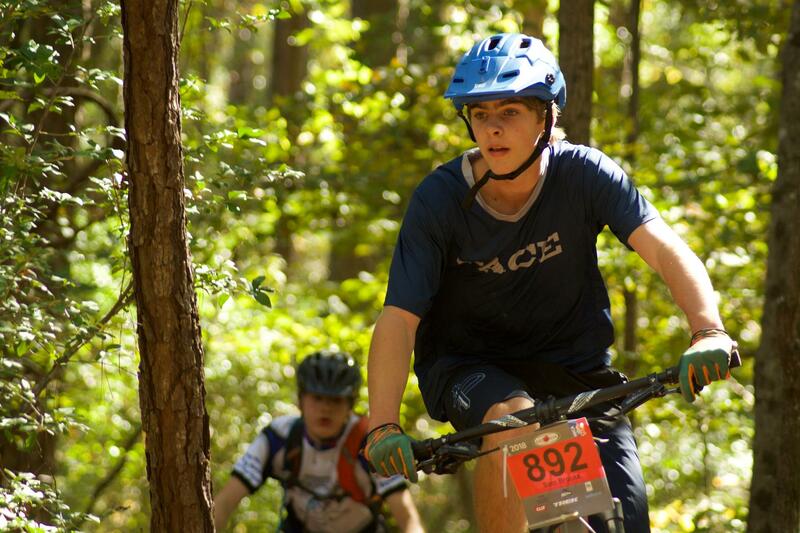 Over the holiday weekend of Sunday, October 7th, a few team members headed to Milledgeville, GA to compete in Race 3 of the Georgia Interscholastic Cycling League race series. The riders faced a 102-degree heat index and 10.6 miles of flat, dusty single track in Bartram Forest which was shortened from its usual 15.6 miles due to the extreme heat. Sophomore Aiden Critz had his best finish of the season, earning 8th place in a pack of 50 sophomore boys. Critz completed the 10.6-mile course in 53:38. Junior Ben Tolliday finished 11th out of 73 riders in the JV boys race. Tolliday finished with a time of 51:20 on the 10.6-mile course. On Sunday, October 21st, the team headed east to Watkinsville, GA to compete in Race 4 at Heritage Park. With plenty of rocks, roots, and hills, the Heritage Park trails provide the most technically-challenging course of the race series. In the freshman boys race, Sam Brooks led the Knights earning 45th place in a group of 96 riders. Brooks finished the 9-mile course in 57:38 followed by Alex Mathias, who finished in 58:14. Jack Warren finished in 1:00:56 and Connor Vance finished in 1:02:58. In the sophomore boys race at Heritage Park, Aiden Critz completed the 9-mile course in 50:46 earning a 9th-place finish in the group of 48 riders. In the JV boys race, senior Ben Solomon finished the 13.5-mile course in 1:19:44, which earned him a 27th-place finish in the group of 65 riders. The Knights take to the trails again on Sunday, November 4th when they compete in the last race of the season at Dauset Trails in Jackson, GA. Both Appling County and Islands High Schools traveled to Pace Saturday to start the State tournament with scheduled back-to-back games. Pace, being the top seed, was the host and home court advantage paid off. 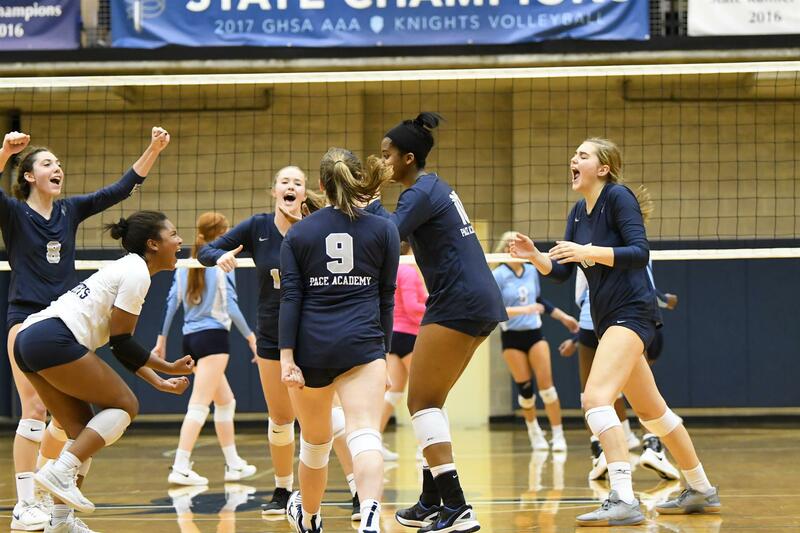 The Knights defeated both Appling County and Islands High School in three straight sets. Highlights include senior middle blocker Sophie Beck posting an impressive attack percentage of .438 with 9 kills vs Islands. Junior Lucy Ferry continued to show she is quickly returning to her true form posting 15 kills and a .464 attack percentage. Sophomore Kalissa Greene racked up another 63 assists. Senior Alexandra Baker posted 18 kills and 16 digs. Junior Ada Jane Agolli had a team high 20 kills. The Knights now move on to the Elite Eight Saturday, October 27th. Location, time and opponent TBA. The Pace Knights varsity football team lost to the perennial AAA power Cedar Grove Saints 40-13 this past Friday on Senior Night before a packed stadium at Walsh Field in perfect football weather. The score doesn't indicate just how close this game was going into the middle of the second half. The game began as the Knights won the toss and elected to receive the opening kick. And what a decision it was as the Knights offense, directed by senior Jared Rayman, went on a classic opening drive marching into Saints territory. The running game powered by senior Keashawn Perryman, sophomore Justin Johnson, freshman Deuce Jordan II helped sustain the historic drive. And why was this historic? Cedar Grove had only allowed 1 field goal in the last 5 games with 4 shutouts. 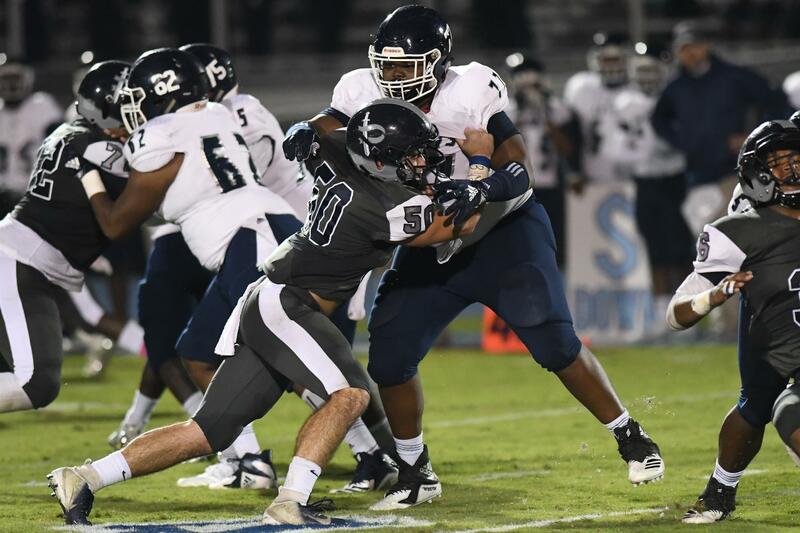 Kudos also to the offensive line for their dominance on the drive led by senior center Chilton Tolliver, senior guard Cameron Hamilton, senior tackle Ashan Hennings, freshman guard Xavier Agostino, and sophomore tackle Christian Bing. The Knight's offense controlled all 12 minutes of the first quarter and the first 5 seconds of the second quarter before settling for a 45-yard field goal by senior Patrick Markwalter to lead 3-0. But, that would be the Knights last lead in the game as the Saints scored on an interception return and a long touchdown in the second quarter to go up 13-3 at the half. Led by seniors Deron Moore and Sam Assaf, the Knights D sacked and pressured the Saints quarterbacks and running backs making them earn every yard they got in the 3rd quarter. Coach Chris Slade had drawn up a defense to stifle Cedar Grove's outstanding wide receiver and #1 ranked player in the state. The Knights double teamed and attempted to harass him all night. Midway through the 3rd quarter, senior Parker Spillers delivered a punishing sack followed by junior Jimbo Smith's pass deflection, and a few Saints holding penalties created by the Hamilton's unstoppable motor. Cedar Grove found themselves in a 4th & 25 and had to punt. The Knights special teams took over as the snap went over the punter's head. As the punter ran back into the end-zone, he was hammered by a swarm of Knights who also recovered a forced fumble for a Pace special teams' touchdown. Now, with 10 minutes left in the third quarter, the Knights had the Saints worried with the score 13-10. However, the Saints firepower took over and eventually wore down our Knights with a couple of big plays that led to a few 4th quarter touchdowns and the win. But after the game, the Saints head coach said Coach Slade had done a number on him and our Knights played with tremendous effort. Nothing like a compliment form the opposing coach! Next up for the Knights: THIS FRIDAY OCT 26th, AWAY GAME 5:15pm @ TOWERS (Avondale Stadium.) This is the last game of the regular season.